Add chips to your collection with Clout Fantasy booster packs. 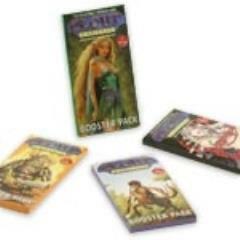 Each Clout Fantasy Booster Pack includes a random selection of two of the 225 base-set chips. Clout Fantasy™ is a collectable throwing game for 2+ players ages 8 to adult. Knowing what to throw is as important as how you throw—can you master both?